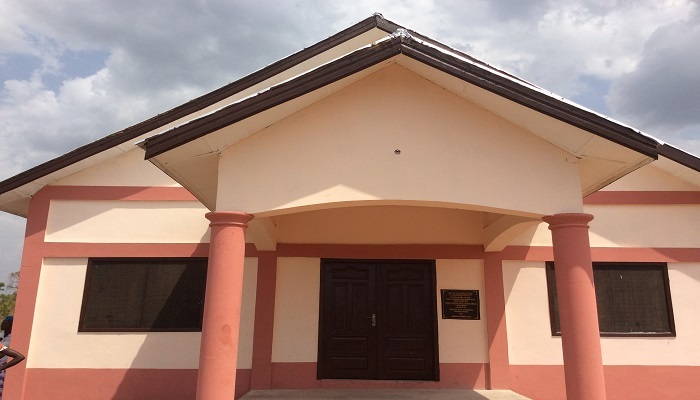 The Wurukwan Assembly Church building of Kyeremankuma District in the Kintampo Area of The Church of Pentecost has been dedicated to the glory of God. The ceremony, which took place on Friday, 8th March, 2019, at Wurukwan, was officiated by the Area Head, Apostle Gideon Obeng-Darko Debrah, assisted by Pastor Paul Nsarkoh, the District Pastor. During the service, the Area Head on behalf of Crawley Pentecost International Worship Centre (PIWC), under Croydon District in London South Area donated a tricycle popularly known as “Aboboya” to the Kyeremankuma district. The sermon was delivered by Overseer Samuel Adae, the District Minister of Bamboi, on the theme, “You are the Temple of God” (Matthew 16:18, 2 Chronicles 6:1-2; 18-21). Pastor Adae explained that when Solomon succeeded his father David as the King of Israel, he built a palace and a temple for the Lord. He asked for wisdom to rule his people and God granted to him what he asked. “God is gathering His people called the church unto Himself. He has placed His name upon them and, therefore, such people are called the people of God because God dwells in their bodies.” He, therefore, encouraged Christians to honour God with their bodies. He encouraged the congregation to be careful wherever they are because the name of the Lord is upon them. He, therefore, called on the church to be holy onto the Lord and exhibit the values and the principles of the Kingdom of God wherever they may go. “Jesus died for His church in order to bring salvation to all mankind. Therefore, the cost of salvation for humanity cannot be equated to the cost of the physical temple built by human hands,” he said. Apostle Debrah, on his part, said: “Some Christians do not understand the concept of God dwelling in His temple. They only believe that God dwells only in the auditoriums. Therefore, when they are in the auditoriums, they behave like ‘angels,’ but when they close, they forget that same God that dwells in the auditorium also dwells in their bodies as His temple. “They do things contrary to the principles and values of the Kingdom of God. No! The same God in the auditorium is the same God that dwells in you wherever you may go as a Christian. “The Church building belongs to God and must not be opened for any worldly activities.” He encouraged the congregation to honour God in their bodies.